Here's my latest chisel video, and the tips I regularly recommend when sharpening them. More chisel sharpening videos below too. Take a look at my recommended Sharpening Supplies if you don't yet have, or are not satisfied with, your sharpening system. Definition of a sharp edge: A sharp edge is the point where two highly polished surfaces meet at an angle, rather than blending in a curve. First prepare the back of the blade flat: The chisel's back is regularly used to guide the edge, and if the back isn't flat you will encounter problems - If the back is concave in it's length, then the edge will tend to dig in and cut a convex curve. If the back is convex, then it will rock, and it's edge isn't under control. It's almost impossible to extend a flat surface too, since the entire back needs to be raised to put the edge in the right position, and therefore there is no reference for the cut. Work the back on a flat abrasive until the first 25mm (1") is entirely ground. If a straight edge placed on this first 25mm, doesn't interfere with the rest of the blade, then you can move on, since the first 25mm will be enough to reference cuts, and the rest of the blade won't cause a problem. Next polish the back: Now work through finer abrasives until this 25mm area is polished. The polish from a fine/super fine bench stone is sufficient. 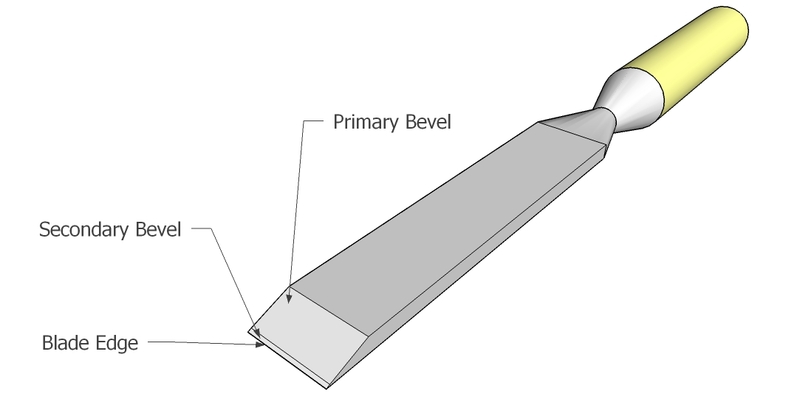 The bevels: It is quite acceptable to prepare a single bevel at the required cutting angle. Indeed, sometimes it is useful to reference cuts using the bevel, rather than the back, in which case a single bevel is desirable. Alternatively, by initially grinding a shallower angle, and then preparing a short secondary bevel, at just under the required cutting angle, subsequent resharpening will be quicker since less metal will need to be removed at the bench stone (of course the shallower (primary) angle will need to be reground from time to time). A very slim polished tip of the secondary bevel, is known as the tertiary bevel. 1. Grind a shallow, hollow bevel of 20° to 25° (for softer to harder woods) on a coarse wheel, quenching frequently and avoiding reaching the back of the chisel, in order to prevent annealing the steel. 2. Grind the primary bevel on a coarse bench stone, using a honing guide to establish the angle (20° to 25°) or by working the heel and toe of the hollow grind until a short flat appears both at the tip and the heel end of the hollow grind. 3. 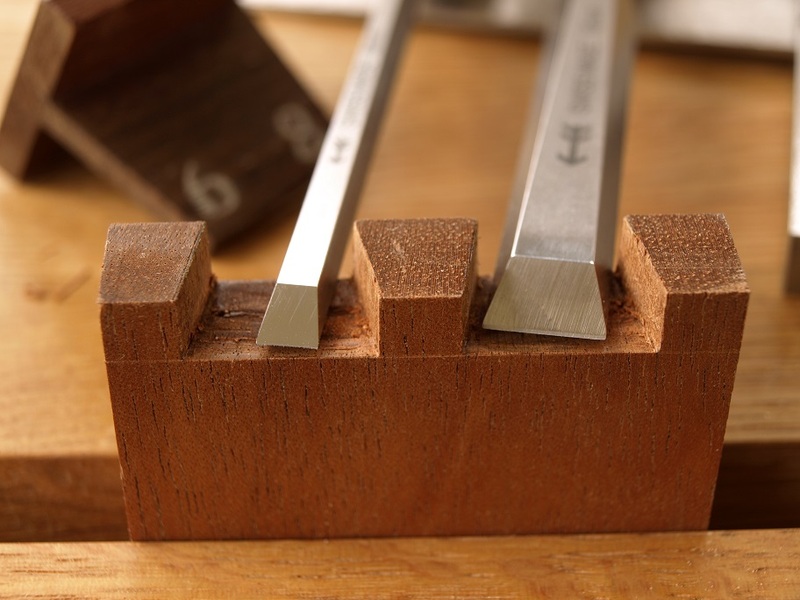 Grind the secondary bevel on a medium/fine bench stone, using a honing guide to establish the higher angle (22° to 28° is a fair choice for working soft to moderately hard woods) or by feeling the primary on the stone and then lifting the heel up appropriately to grind. The secondary bevel need not exceed a couple of mm's (1/16"), as this will impart sufficient additional support to the cutting edge, but it should produce a continuous wire edge to the blade. 4. Polish the secondary bevel, or just the tip of the bevel, on a fine/super fine bench stone. If just the tip, then you'll produce a tertiary bevel. A honing guide can be used, or this can be done purely by feel. 5. Remove the wire edge by laying the back of the blade, totally flat, on the last bench stone, and pulling backwards while applying downward pressure on the last 25mm. 6. Finally strop the edge on a flat piece of leather charged with polishing compound. Because the flatness of the back is critical to good performance, concentrate on the bevel side, with only very light, flat pulls on the back to turn the wire edge over. Stropping the back hard, is enough to 'lift' the edge away from the reference plane, and ruin the chisel's performance. The sharpened edge should easily shave the hairs off your arm!